Campus is a thriving hub of activity from University events to nearby nature trails. Attend a lecture, workshop, performance or rally on campus. Stroll or ride across the grounds, soaking up the scenery. Twice a year the Associated Students of the University of Oregon (ASUO) host a street faire along 13th Avenue. 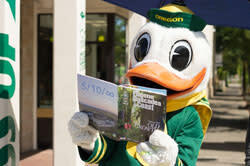 University of Oregon Tour - a 30-minute information session and 90-minute walking tour led by a UO admissions counsler. Learn about admission requirements, financial aid, scholarships, campus housing and adjacent Eugene neighborhoods. Offered Monday - Friday at 9, 10, 11 a.m. and 1 p.m. On Saturdays, offered at 10 a.m.
Campus Sustainable Initiatives (PDF) - See the green side of campus. Campus Tree Tour (PDF) - Explore the University of Oregon campus, a living arboretum with over 500 types of trees. Hike up to Hendricks Park to view hundreds of blooming Rhododendrons in the spring. Learn about wine making in the rolling hills of the South Willamette wine country. Explore the rivers on a white water rafting trip down the McKenzie River or go fishing on the Willamette River. Head to the coast to ride the scenic dunes on a dune buggy or sandboard, kayak the Siltcoos River or enjoy a leisurely day in Historic Old Town Florence. Hike to cascading waterfalls, soak in hot springs, or mountain bike in Oregon&apos;s Cascade Mountains. 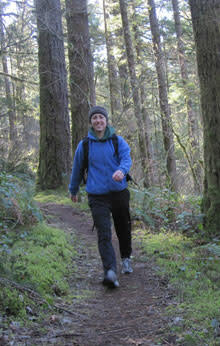 Short but steep, this popular trail has breathtaking views. Sip beer and people watch on Taylor's Bar & Grille patio. Browse unique artisan wares in a colorful outdoor market. Drive an hour west and put your toes in the sand. Browse over 3,000 pieces of Asian art in the Jordan Schnitzer. Rent a bike and cruise across campus or along the Willamette River bike path. For TrackTown USA, this is hallowed ground.